Verapamil is a blood pressure medication that has been found to improve chronic migraines and cluster headaches. I’m actually surprised it isn’t used more, and that I hadn’t heard about it until the last six months or so. A search of the literature shows that it’s been in use for migraine treatment since the mid-80s! A small survey over on Migraine.com showed that 38% of respondents (myself included) showed a significant improvement with Verapamil, another 11% reported complete elimination of symptoms. Those are some pretty good results. I started Verapimil in September. The day after I started it a new cluster headache started, so I called my doctor and he increased the dosage. Given my tendency towards side effects he’d initially started me at only 100mg, less than a week in (because of the cluster starting) he upped it to 184mg. The cluster headache was gone within 10 days. This was an awesome result, as cluster headaches usually last months for me. About 10 days later, a new cluster headache tried to start (just as we were heading to vacation, of course), but again it only hung out for two days. Since then I’ve not had another cluster even attempt to start; however, migraines have continued but have also lessened. There were two more in October (in addition to the cluster headache that lasted for two days). Overall, this is a huge improvement. I would not complain at all if I only had four migraines a month. In November I recorded five migraines. It’s important to note that I only record migraines when I deem them bad enough to take one of my limited migraine meds. I only get 6 Relpax a month now, thanks to my insurance, and my Neuro will give me an equal number of another med that works about as well (but also leaves me really hung over). The best news is that as of right now (Dec. 19) I’ve not had a migraine worthy of Relpax in over a month. A MONTH! That’s freakin awesome. But, what about side effects of Verapamil? The same survey reported 36% with no side effects, and another 30% with only slight side effects. As is too often the case, I tend to be a 1%er, if there’s a rare side effect I will stumble upon it, and that’s what happened with Verapamil. I’d love to tell you that I had no side effects, but that’s not the case. In the last few weeks, I’ve noticed an increase in a couple of symptoms, one of which is kind of new. The first is general joint pain and inflammation. Everything hurts more lately. Initially, I attributed it to the semester and to just being worn out, I needed to eat better, etc. But, now I’m not so sure. The second is something sort of new. I’d been waking up feeling like my feet were on fire, just aching and swollen, as if they were beyond dry and I’d been walking on them all day in bad shoes. This has progressively gotten worse, and once I established that it was definitely more than just dry feet and really started thinking about how they feel, I realized it was something more. The only new med is the Verapamil and it’s been about three months. I did a search to see if this type of thing was a normal side effect and initially I didn’t find it in the standard lists, but when I searched for “Verapamil and burning feet” I found it was connected. It’s something called erythromelalgia. The symptoms of erythromelalgia are very similar to those related to small fiber polyneuropathy, which is also related to fibromyalgia. Oddly enough when this started I’d just seen my neuro and he’d upped the dosage of Verapamil to 240mg to see if it would continue the improvements (because I’d still had five migraines last month). However, I had decided to finish out the bottle of 180mg before I moved up, and I’m glad I did. The nurse called me back pretty quick and told me to stop taking it. I’m really rather bummed about the side effects, and last night I was still debating if they were worth the improvement in the migraines, but this morning when I realized that the more pressure I put on my feet, the worse they get, I knew I needed to make that go away. Overall, it looks like taking Verapamil for migraines and cluster headaches has a pretty good success rate, and given the success I saw I’d say it’s worth it. Looking at the general side effects they are few and minor. 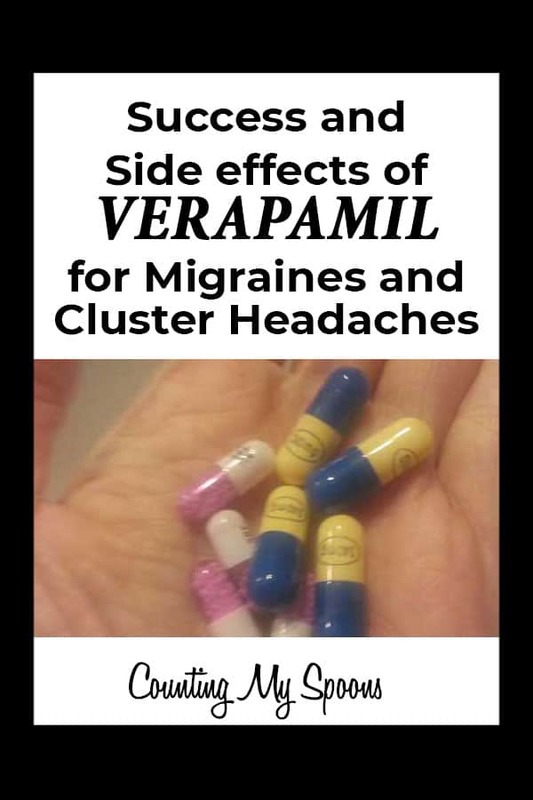 Unless you just happen to be like me and one of those “complicated cases” that manages to find and report the really rare side effects, if you have chronic migraines and/or cluster headaches, it’s probably worth giving Verapamil a try. This post is very interesting to me, because I have them on standby for their original intention (breaking a faulty heart rhythm). Usually 40-80mg is sufficient. Otherwise I’m advised to go to the ER instead of taking more. As this post was in 2015, just curious if you’ve tried other beta blockers since then? I was on verapimil for a little over a month. I usually adapt to meds pretty quickly but this one, I don’t know. I too had more painful joints and was more exhausted .I have chronic migraines… I was getting them multiple times a month and they lasted what seemed Like forever. Weeks. The ONLY thing I have found to work is Rick Simpson oil. Capsule form, a tiny bit at bedtime .I have only had two or three migraines since March. That’s HUGE for me. Sorry, hit enter too soon. Anyway, I’m sorry you had to discontinue Verapamil. You think you find this mini miracle when a medication does a good job at alleviating symptoms. I was looking forward to Savella hitting the US market. When I was working, I analyzed foreign and US companies trading on major stock exchanges. That’s how I found out about Savella. I waited and hoped it would get FDA approval because my Fibro and nerve damage pain were very bad and Neurontin is a necessary evil for me. I was put on Savella very soon after it received approval and I swear it felt like a miracle. I slept better, I dreamed, my pain threshold was at pre-Fibro level, I had energy. I was also able to reduce my Neurontin dose by 600mg. Then, after several months, my migraines got worse and my hypoglycemia was constant. Savella can increase blood pressure and reduce blood sugar. Having to discontinue the only medication to make me feel normal was so disheartening. To this day, no other medication has worked that well. For your headaches, do you want to maybe request a beta blocker? It may help you quite a bit and you may tolerate it better. As always, I wish you more good days than bad. I will look into beta blockers next. I think that was the other thing he mentioned when we went this route. I’ve done Topomax and won’t do that again. I had the issues with both Savella and Cymbalta, I don’t know that either of them did a lot for me, but after a few months the side effects over-rode any potential benefit. A friend has been on her beta blocker for years. It cut down dramatically the number and severity of her migraines. She gets a little woozy at times but, her blood pressure was a bit low pre-medication. You could do very well on it. I hope your doctor writes a script soon. I take 240mg per day of Verapamil for migraines. I began taking it years before I first saw my neurologist. Beta blockers are known to work better than calcium channel blocker but, I had a hellish reaction to Atenolol. My neurologist tried to increase my Verapamil dose to 360mg. It worked well at preventing the worst of my migraines but, it made me so lethargic that I slept for hours starting about 45m after my midday dose of 120mg. I think it’s interesting that Verapamil makes me more tired than Neurontin and Ultram combined.